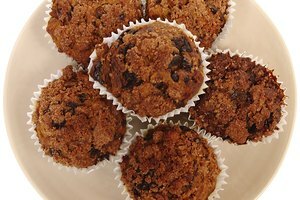 Homemade muffins are a treat that can be served as a snack, dessert or breakfast. 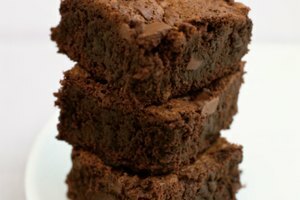 However, many inexperienced bakers have trouble achieving the ideal soft, moist texture. Muffins are a very delicate baked good and require a light hand. 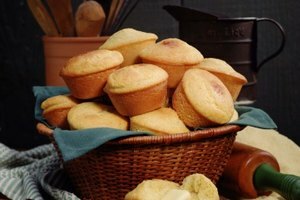 If your muffins are coming out dry or hard it is probably because you are being too rough with the batter. Poorly conceived recipes can also be problematic. To avoid baking dried out muffins that nobody will touch, become familiar with the root causes of poor texture. Over-stirring the batter is a common cause for dry, hard muffins. You should mix the batter until the dry ingredients are just moistened. Do not worry about getting the lumps out. Fifteen to 20 stirring strokes with a wooden spoon should be plenty. Never use an electric mixer. 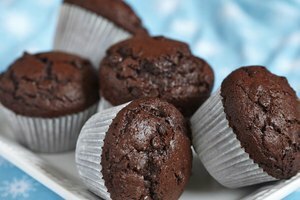 If a recipe does not include enough baking powder, your muffins will have a poor texture. Baking powder reacts with other chemicals in the batter, causing air bubbles to form during the baking process. Without these bubbles, your muffins will turn out very dense and tough. Most recipes typically call for two to three teaspoons of baking powder. If a recipe includes too much egg, the muffins will come out dry and rubbery. If this is happening, try reducing the amount of egg in your recipe or find a new one. Most recipes call for only one egg. If you bake muffins for too long or at too high a temperature, they will become rubbery and tough. This is particularly true if you are using a dark, non-stick pan, since these absorb heat better than other types of cookware. When baking muffins, use a shiny, greased pan and monitor them closely while they are in the oven.